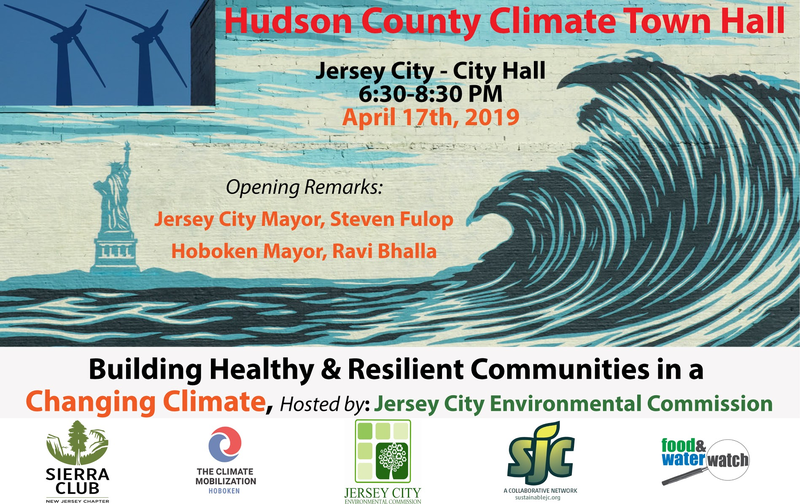 Please join the The Climate Mobilization, Jersey City Environmental Commission, Food & Water Watch, The Sierra Club, and Sustainable Jersey City for a special event. Join local residents, grassroots groups, environmental non-profits and local officials at the Hudson County Climate Town Hall. This collective event will open a dialogue on how we can work together to build healthy and resilient communities in a changing climate. Mayor Fulop, Jersey City, and Mayor Bhalla, Hoboken, will be making opening remarks. Attendees will hear a panel discussion on local issues, including the Meadowlands Power Plant proposal and the effort to reclaim the Union Dry Dock for Hoboken’s residents, and explore how local issues relate to state and national policies including clean energy investment, coastal resiliency, healthy communities, and a Green New Deal. Local organizations, environmental groups, and student groups will tend tables, providing attendees the opportunity to learn more about what’s happening locally to address climate change and how to get involved. To learn more about the event and RSVP, please check out the Eventbrite page. The event will take place at on April 17th at Jersey City City Hall, 280 Grove St, from 6:30-8:30. We look forward to an informative and impactful event, and we hope to see you there!